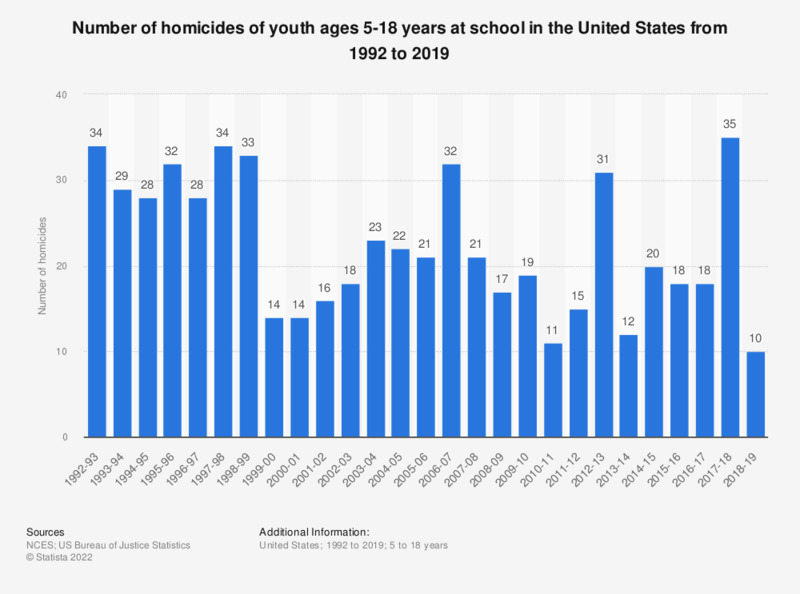 This graph shows the number of homicides of youth ages 5-18 years at school in the United States from 1992 to 2016. During the school year 2015-16, around 18 youths aged between 5 and 18 years were the victims of a homicide, in which the fatal injury occurred on the campus of a elementary, middle, or high school. A school-associated violent death is defined as “a homicide, suicide, or legal intervention (involving a law enforcement officer), in which the fatal injury occurred on the campus of a functioning elementary or secondary school in the United States” while the victim was on the way to or from regular sessions at school or while the victim was attending or traveling to or from an official school-sponsored event. Victims include students, staff members, and others who are not students, from July 1, 1992 through June 30, 2016. “At school” includes on school property, on the way to or from regular sessions at school, and while attending or traveling to or from a school-sponsored event. Estimates were revised and may differ from previously published data.